Traditional Italian sponge fingers, perfect for desserts and home baking. 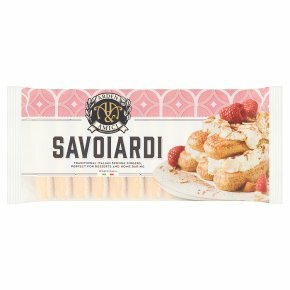 Suitable for vegetarians.La Dolce Vita Our sweet and delicate Savoiardi sponge fingers are perfect for creating delicious desserts like trifle or the Italian classic Tiramisu. Light and airy, they're also a treat served simply with Espresso or ice cream as you'll often find in Italy.